With blistering performance, the Nissan Skyline GT-R has made a welcome come-back to the Japanese motorsports scene. The legendary Skyline GT-R was first created in 1969 as a road-going racer, and immediately won praise from motorsports enthusiasts. 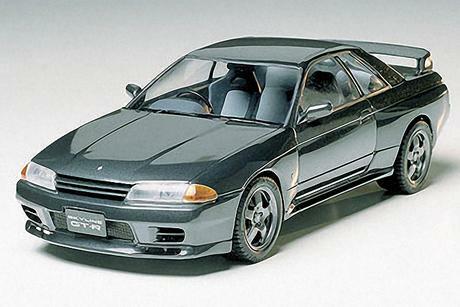 In May, 1989, Nissan unveiled a reincarnation of this superlative automobile, 16 years after its previous GT-R. The powerplant in this vehicle is a 2568cc, six cylinder, DOHC, 24 valve, twin ceramic turbocharged and intercooled 280 horsepower engine, which was designed from the outset for competition use. In order to effectively transmit this tremendous power to the wheels, the Skyline GT-R incorporates Nissan"s original ATTESA E-TS variable torque-split 4-wheel-drive train, and a SUPER-HICAS 4-wheel-steering system. Combined with its refined multi-link suspension geometry, the vehicle minimizes the spin potential during hard competition running. Powerful ventilated disk brakes all-around ensures no fade stopping performance at the track or on the street. The aggressive body styling is sculptured by the massive front and rear blister fenders, front air-dam, and large rear spoiler to obtain downforce performance. The hood and fenders are of aluminum for weight-savings. Packed with Nissan"s latest automotive technology, the Skyline GT-R is unquestionably a world class performer.